Kristi Johnson was commissioned at the 2016 Annual Meeting and now serves as a Serve Globally missionary in Thailand. How does teaching English help spread the gospel? I have been surprised by the number of times I have been asked this question. I am surprised because I never stopped to separate the two in my mind. I teach English, but I am also a witness for Christ in my family, my neighborhood, and in the world. If I had to make a distinction, it would be this: teaching is what I do, being a witness is who I am. Pastor Russ Blake shared a message that spoke to me clearly about this. No matter where we go, whether to our local Starbucks or to Thailand, we carry the responsibility to share Christ as we go. In doing this, we are to be intentional, interpersonal, and inspirational. 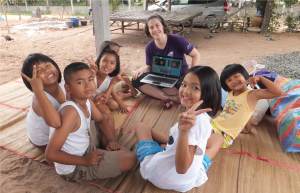 As I have had the opportunity to serve in Thailand I have seen how this kind of witnessing makes a difference in communities and in the hearts of individuals. The Covenant church in Roi Et, Thailand, continues to grow in amazing ways. New churches are being built as groups of believers have grown too large to meet in homes. There is excitement as more and more people want to know who Jesus is. The church has been intentional about trying to meet the needs of the community and sharing Christ along the way. As Pastor Daeng and his wife, Tipawan, served the community, they kept hearing requests for more opportunities to study English. This would help students further their studies or find better jobs. After a lot of prayer and dreaming, the church now has a new community center in town. The church gathers there for worship, Bible training, and music seminars. Soon the doors will be open for English classes as well. Teaching often opens the doors to special relationships. When I started teaching an afterschool English club at the Covenant camp in Roi Et, I did not know what to expect. These children became some of my most faithful students. That’s where I first got to know Fern. Like many children in northeast Thailand, Fern lives with her grandparents while her parents work in other cities. This is a very common situation, and some children only see their parents a few times a year. Fern, who was outgoing and enthusiastic, often invited new kids in the neighborhood to come and learn English. After a few months, we even began hosting the English club at her house instead of at the camp so more students could come. As this relationship grew, I was invited to become part of her family—gathering for holidays or meals just came naturally. Because of this relationship, we have prayed together and shared words of blessing and encouragement. English can also be an avenue to inspire others to step into something new and be transformed by God in unexpected ways. When you first meet Pong, she can seem quiet and shy. She admitted that in the past, it was difficult for her to take the risk of talking to new people. Foreigners were especially intimidating because she felt she had nothing to share or say. Whenever a visitor came, she would look for excuses not to be a part of the activities. For some reason, however, Pong felt comfortable with me and took on the challenge of studying English. A spark ignited in her. 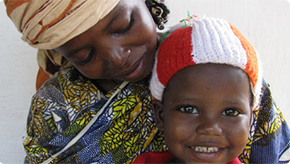 She began helping me with the children’s programs in the villages. She talked with the adults who gathered, telling them what we were doing and why. She shared about her faith and God’s love with others. Before Pong became involved in the English program, she had been quite unhappy and wanted to return to her home village. She wasn’t sure of her role in Roi Et or in the church, and she was homesick. But God changed her heart and she became a witness to her family, her community, and the world. Studying and teaching English? That’s what Pong does. Being a witness? That’s who she is. Used with permission of the Covenant Companion. Originally published as part of the July 2016 Serve Globally newsletter.